Just after new year we made a day trip to Clacton to see Ann's brother Fred and his wife Lyn who had moved there just before Christmas. There was a rare opportunity to capture the two together in the same photo. In February Ann and I were woken in the early hours of the morning when the earth moved and the house shook whilst we were in bed. Ceri slept through the event. I was so shocked by having the earth move that I came over faint and had to go off sick from work! It later transpired that others in Shepshed also experienced an earth moving event due to an earth quake of 5.3 on the Richter Scale centred on Market Rasen (more on there later) and not due to a “la la la la” event as Ceri might say these days. Ann and I started to practice going out without Ceri, by going to a Bingo night hosted by Shepshed Town Twinning held at a local old people’s home. I reckon we were the youngest there. It was a fund raising event for my Domont trip in September. Ann got a full house, and had to cut cards with another player who also called at the same time. Ann won, drawing only a 3! Ceri passed her driving test in June which resulted in 2 nights of partying to celebrate. In July we traded our old faithful Mondeo for a newer one, 04 reg and 76K on the clock. Based upon the length of time we had the old Mondeo and its predecessor, the Maestro, our new Mondeo may be our anti penultimate car! After we got the new car, Ceri made use of it for driving practise post test and ended up at one stage clocking up more miles then me! Ceri did well enough in her A levels to get accepted at her first choice university – Sheffield University to do a MEng course in Chemical Engineering and a modern foreign language. Why “Fathers Footsteps” – I did a chemistry degree and uncle Philip who might be described as her genetic father did an engineering degree. Ceri also joined the Scout and Guide Club – like her proper father and genetic half sister. 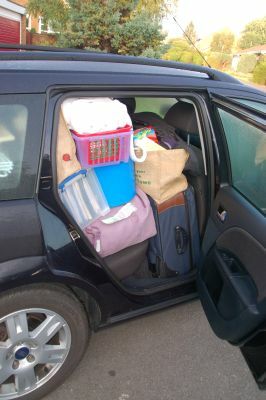 When one looks back to leaving home with just a rucksack and a holdal when I went to big skool, what Ceri took proves the rule about filling the available space! Ann is Officially a Pain in the Neck! Ann’s OACH still causes problems with her seeing imaginary dirt. Apart from that and trapped nerve she has had good health this year. The trapped nerve was in her shoulder and caused her tremendous neck pain which resulted in Ann being signed of work for 3 weeks. Ann self treats her OACH condition by frequent bouts of unnecessary housework such as cleaning a clean kitchen upon Ceri's arrival at her big skool flat (L) and washing up for Ceri's fellow university flatmates (R)! Ceri’s Guilt Gets The Better of Her! Ann did have a very slight improvement from her OACH when she went of to work leaving a trial of mud through the house as she had done some work in the garden and forgotten the time. Ceri came in without looking and she later saw the mud and immediately thought she had brought the mud in – resulting in Ceri panicking and cleaning it up before Ann came home, much to Ann’s amusement! I even got a phone call at work asking “how do you get mud of the carpet?”. The new skills Ceri learnt that stay were put to good use on the last day of term to impress mummy when picked her up from Big Skool. 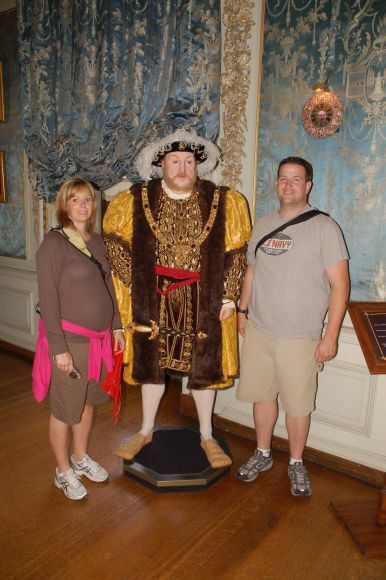 This summer three of our Canadian cousins came over, Cousins Jim and David and his wife Tammy seen together at Warwick Castle, Jim has taken is glasses off as he is so vain (Cousin Betty will not be amused!) With generous luggage allowances from the US and Canada, they made full use in bringing over various goodies for the family. They even managed to bring 20Kg of a white powder through customs for me, no not cocaine, but best Canadian wheat flour for bread making. Their trip this year took them to Belgium and Austria and the nether regions of the East Midlands as we hosted them for a week. I picked them up from Thiefrow Airport and we only just got their luggage into the car. I also picked Ceri up from Thiefrow at the same time as she had gone to Germany for a long weekend. Whilst staying with us I took them to various stately homes etc which ended up through serendipity having a “Bess of Hardwick” theme (Chatsworth, Hardwick, Bolsover, Calke, Kedleston and Warwick Castle). Ann was working that week but had Wednesday off , so on the Wednesday (as in the Lumberjack song) Ceri and Cousin Meli who came up for the day, took Tammy to the very stately home of Meadow Hall near Sheffield, whilst Ann and I took David and Jim out to Hardwick and Bolsover. With the wet weather there was an abundance of slugs this - but not as many as we saw in Danmark in 2005. 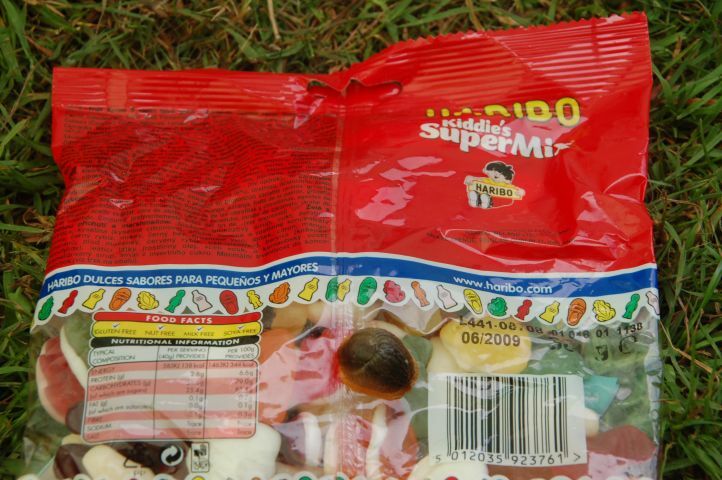 Ceri got a fright when she found the above on a packet of sweets, Fortuntley the bag was still sealed otherwise one would probably eaten it without realising! Whilst the Canadians were with us, my weekly time trialling could not be missed. So I recruited cousin David to ride the time trial on the Tandem with me. That included the ride to the start, the time trial and then the ride home. Cousin Jim and Tammy were driven to Kingston upon Soar to watch us ride past and take photos. The West Leake TT course is a two lap course, as David is not used to riding far on a bike let alone time trialling I was going to ride the one lap only. However as we got half way round the first circuit – the others had not got there yet so we had to ride round again for the photos. After the finish Ann and Ceri presented David with a gold medal as a consolation for the Canadian performance in the Olympics. At least David can claim the Canadian best time for the West Leake TT course. After the finish we all went to the Station Hotel at Sutton Bonington for a meal where we were joined by Karl and Simon from work. After the meal we boys took David home on the bike via the Cap and Stocking at Kegworth, (Bass bitter brought up to the bar and poured from a jug), which resulted in call on my mobile shortly before 11 asking where we were! Still in the pub and an arrival home past midnight did not go down too well. The key thing is David enjoyed it and sampled some fine English ale. 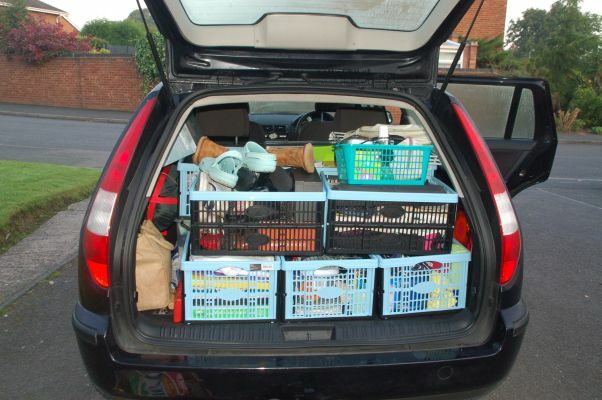 Living in student accommodation, Ceri misses certain home comforts: a sofa, mummy, dishwasher, mummy, and a bath. The later she has found an alternative – which allows a weekly bath. She has joined the canoe club and goes canoeing on Friday evenings at a local swimming pool. This enables Ceri to have a “Shepshed bath” when she practices Eskimo rolls. There was drama on the first Friday in December when Ann received a text “Had accident will phone tomorrow”. It transpired whilst having her weekly bath, Ceri managed to cut her toe whilst getting in to a canoe. 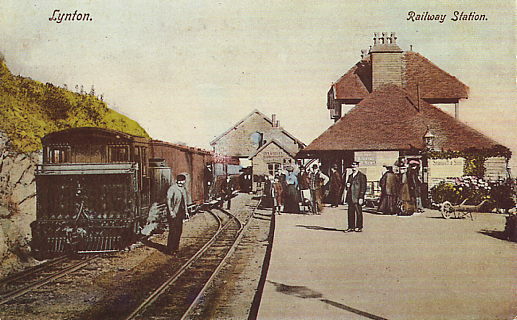 Easter we played the Great Railway Game with our friends from Oxford, after sending them all over the country, including Lynton several times, they took the hint and in the summer we received a postcard from Lynton railway station (closed 1935). 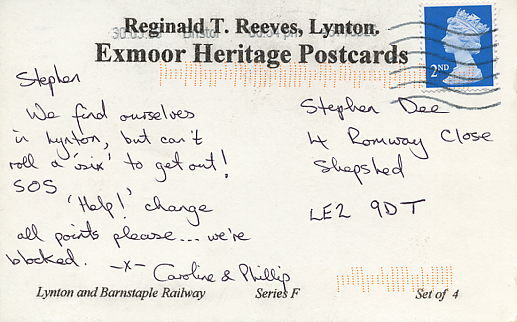 The message would make sense to anybody who has played the Great Railway Game and been sent all over the place! 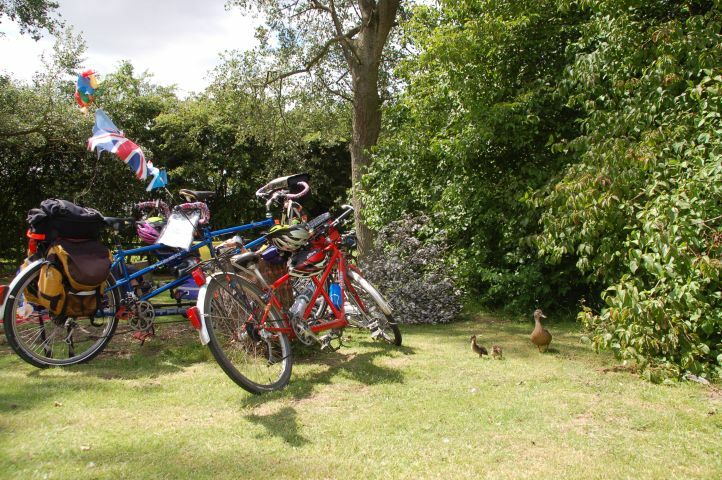 At the end of June we went to the Tandem Club family camping weekend near Bedford organised by the Davies family. It was a dry but windy affair with our large tent taking a battering on the Sunday. It was the tenth family camping weekend for the Tandem Club and we are the only family who can claim “We been to them all”. The Saturday ride took us into Bedford for picnic by the river and Sunday we rode to Grafham Water via St Neots. Whilst stopped for lunch at Grafham Water a family of ducks took an interest in the Bowen's Tandems. We had planned to go straight onto Cornwall for our main holiday after the Tandem Club Family Camping weekend. However due to the high winds we went home first and swapped tents for our faithful Hillebergs. This proved to be a wise move as the weather in Cornwall this year was not its best. We “toured” rather then staying at one location. We started just south of Bude so we could go to Tintagel. Then we moved on to Newquay. 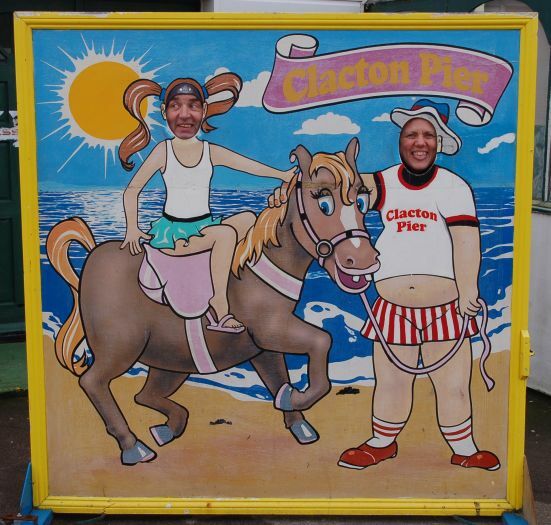 It was wet there – we went for a walk along the seafront and it was worst then Blackpool in February! 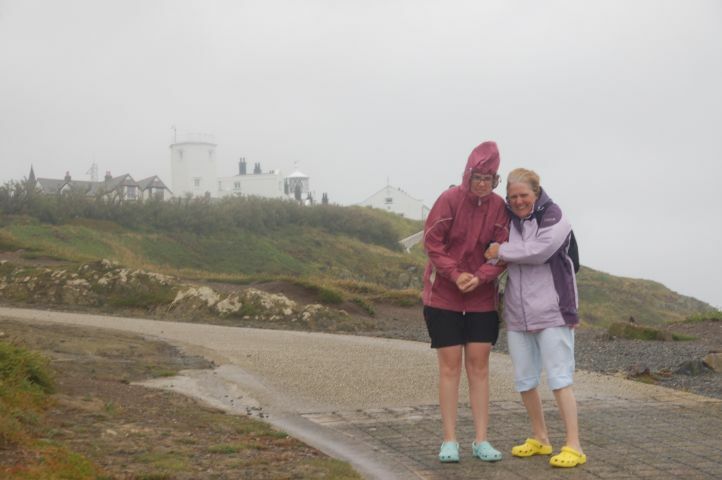 Whilst in Newquay, on the Saturday we drove south to find better weather, but found rain and force 10 winds at The Lizard. We moved on from Newquay to Sennen, stopping on en route at St Ives – The weather at Sennen was not much better but we did manage to cycle to Land End. We cut our holiday short when we found out our last site we had booked at Bodium was closed due to flooding. Whilst in St Ives it was about the best day and only day worth having an ice cream. However I barely had lick of mine when it was snatched by a seagull, see above. 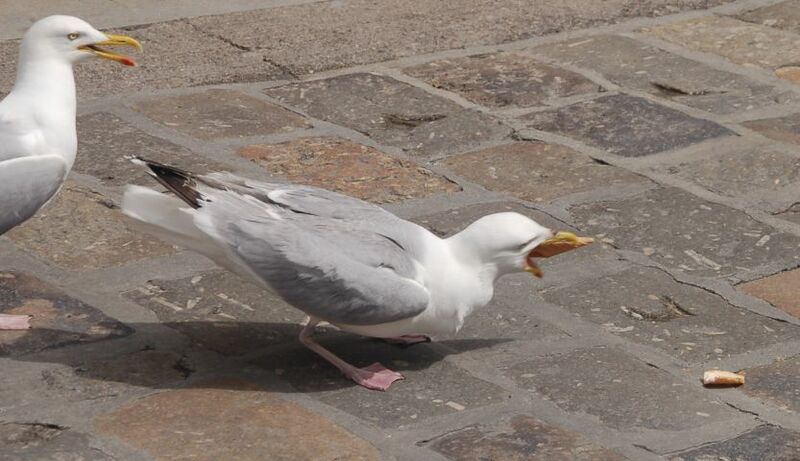 The seagull was so quick by the time I got to atke a photo the last of my ice cream was disappearing down its gullet. 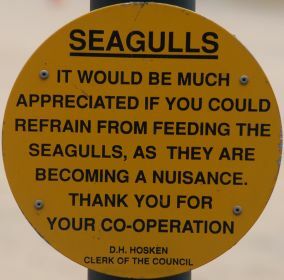 (Twitchers take note according to the notices all around Cornwall seagulls do exist – apparently I was being naughty by feeding one). Mayday weekend Ceri and I went as per tradition to Blaxhall with the Tandem Club, Ann was working so she was left behind. It has since transpired it was the last time the event was to be run. Ceri and I managed to ride all the way to Southwold and homage to Adnams - the first time we have done that on a Blaxhall visit, our previous visit we had a car assisted ride. With Ceri swatting for A levels, I went for a ride by myself to Felixstowe on the Sunday and as per tradition Ceri and I went to Framingham on the Monday. Ceri Meets a Real Toad! In the week before going up to Big Skool in Sheffield Ceri managed to get herself a job in Student Union bar. 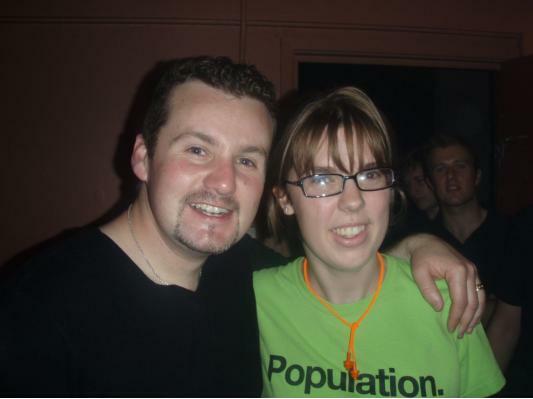 One perk was she had a private photo and autograph session along with the other bar staff with Toadie from Neighbours following a Student Union event. As first year students get the rubbish night time shifts Ceri handed her notice in halfway through term as it was playing havoc on her beauty sleep, not that she needs it. Ceri also met and had a photograph taken with Will Mellor (he played Jack Vincent in Casualty) on a night out at the Student Union. I caused the girls at work to put their fingers in their ears and go “la la la la”, when I stated “I am having a good time tonight” as I left work. Our monthly boys’ night out after work cycle ride, in the summer turned in to a weekly ride out on the Loughborough Phoenix time trial. My first ride with saddle bag and panniers was not my worst – my second week I had my slowest time without luggage. Starting time trialling for fun resulted in my going to a local bike shop to buy new tyres and coming out with a pair of tyres, wheels frames, saddle, brakes and gears – ie a new bike! Ceri got involved with Guiding again this year by helping out at a local Rainbow Unit as a Young Leader. Ceri has continued with her Young Leader activities by volunteering her services to the Sheffield Guiding Association. In return she got to help out at a Rainbow Unit in Abbbeydale, on the Posh side of Sheffield. One perk of being a young leader Ceri got to help out at the Guide Association Big Gig, with Scouting for Girls topping the bill, at the NEC in Birmingham. The only problem was that on the weekend of the gig Ceri finally succumbed to Fresher’s Flu, so she helped out for the afternoon concert and then missed her free ticket for the evening concert. 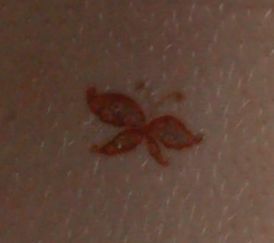 As a wind up for work Ann had a tattoo done one her back. However it did not last long as it was a kiddies transfer rather then the real thing. Also it was not a “rude” one or her name as in the Who song. 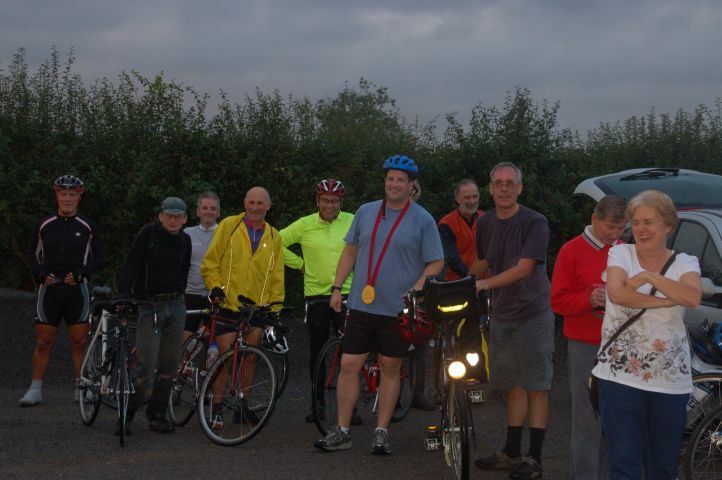 Mid September I had a long weekend cycling with Simon and Karl from work and Mick from the Loughborough Phoenix. I had organised the trip as a reciprocal visit to Domont, Shepshed’s twin town following their cycle tour to Shepshed last year.. I had hoped to cycle all the way from Shepshed, but that was not practical. Instead we got the Thursday morning ferry from Newhaven to Dieppe and cycled from there, taking 2 days there and 2 days back on the Monday and Tuesday. Our Thursday night stop demonstrated one literal translation of “Relais”. Posh dictionaries translate the word as “coaching inn”, cheaper dictionaries translate the word as “Truck Stop”. Truck stop was a very appropriate translation – but with the fixed price meal we had at Relais Des Hayons and no noise after ten, it was a superb place for a stop on a cycle tour! We were met Friday lunch time in Gisor, by 5 cyclists from UC Domont who were our hosts. Upon arrival in Domont we were treated to a formal reception. 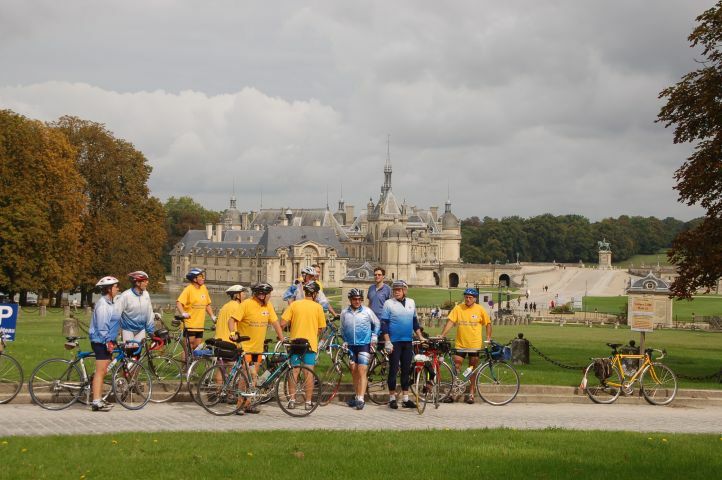 Saturday and Sunday we rode out with UC Domont around the Val d’Oise, which is north of Paris, visiting such places as Chantilly – picnicking by the lake in front of the Chateau admiring a few horses (and riders) and van Goch’s grave. On Monday our friends from UC Domont rode out with as far as Gisor where we parted. I was hosted by Michelle and his wife Sylvie. It turned out Michelle is “Mon autre jumeau”, as he is a day younger then I am. Our trip made the local paper with a nice photo of our arrival. With both Ann and I working between Christmas and New Year, last year, we hosted the cycling family Hogmony, as it meant we could go and not worry about rushing to friends and then getting Ann back for work New Years Day. Despite being at work until just before 3pm – I still was able to host the hard riders New Years Eve ride, taking them over the Charnwood Forest looking down upon some early evening firework displays from the Beacon. New Years Day, the main family ride was to Worthington and the play park in the village. After every body left we were left with 5 items of lost property. 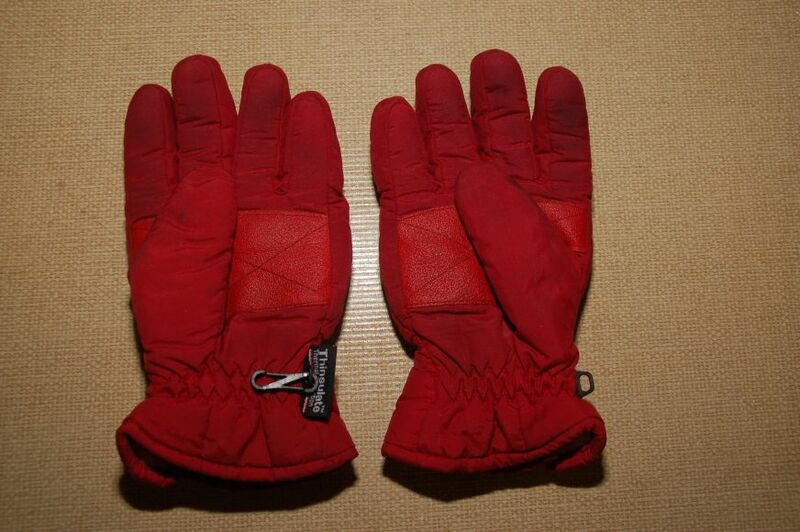 I was misinformed as to the owner of a nice pair of mittens. I rode all the way and back to Oadby to return them to Libby only to find out they belonged to Megan from Bedford! 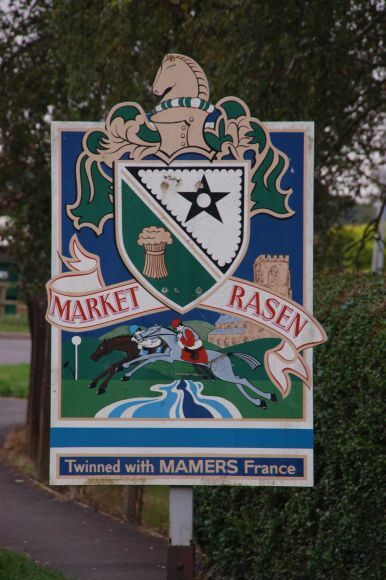 Tandem 2008 was at Market Rasen in Lincolnshire. Ann was working so it was a traditional leave mummy at home holiday, but this time in the UK. We rode the medium routes with our usual variations, mostly planned, although on the first ride we did go "off piste" and had to do a few extra miles to get back on route. 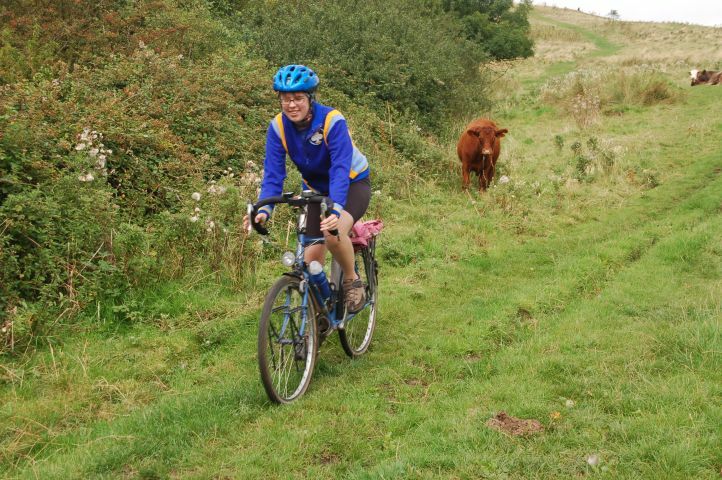 Some of the variations also included Ceri volunteering to ride along some interesting rough stuff routes. The above photo is on the rest day when Ceri and I went out on solos and rode a short bit of the Viking Way. We also rode part of the above route on Tandem at the end of the week. We also broke with tradition and on one ride we had a café stop rather then a traditional drum up.